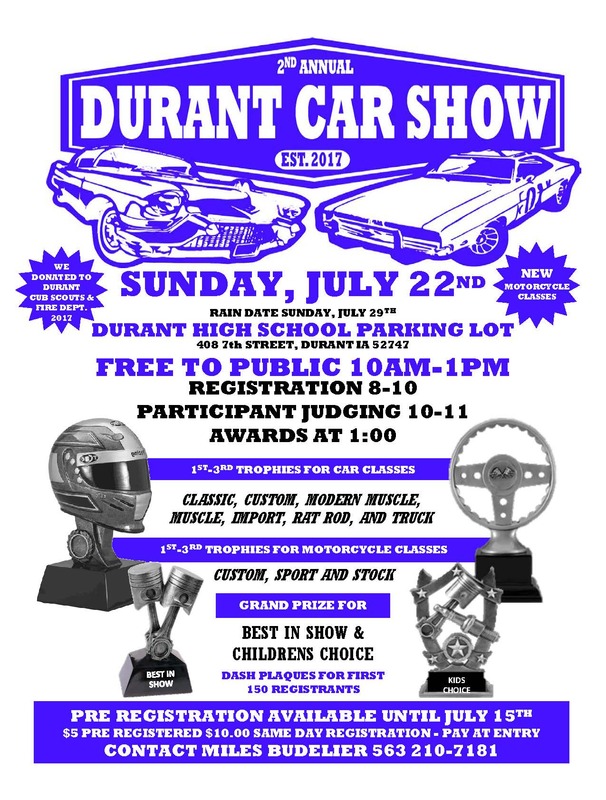 The car show will be held July 22nd, at the Durant High School Parking Lot. Invited to the show will be cars of every kind: Classics, Muscle Cars, Trucks and Special Interest cars of all types and sizes. This year we are also inviting Motorcycles, we are very excited about this addition. Last year we there were 165 cars registered, and with the addition of motorcycles, we could have even more this year. Our car show is open and free to spectators who enjoy cars and a good time from 10-1. 1st – 3rd Trophies for the following Car Classes: Classic, Custom, Muscle, Modern Muscle, Import, Rat Rod and Truck. Motorcycle Classes: Custom, Sport and Stock. Also Grand Prize Trophies for Best in Show and Children’s Choice. Dash Plaques for first 150 registrants. $5 Pre-Registration available until July 15th OR $10 at the gate.